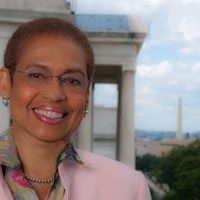 WASHINGTON, D.C. – (RealEstateRama) — Congresswoman Eleanor Holmes Norton (D-DC), co-chair of the Quiet Skies Caucus and a senior Member of the House Transportation and Infrastructure Committee’s Aviation Subcommittee, has gotten several of her provisions to help address airplane noise included in the House bill (H.R. 4) to reauthorize the Federal Aviation Administration (FAA) for six years, which will be considered on the House floor this week. Norton’s first priority has been provisions to prevent or reduce airplane noise, which has plagued parts of Wards 2, 3, 4, 7 and 8. The provisions she got in the bill include ones to address community noise concerns, study ways to more quickly phase out noisier, older aircraft, review the relationship between aircraft noise exposure and its effects on communities around airports, update airport noise exposure maps, ensure community involvement in FAA NextGen projects located in Metroplexes and implement an environmental mitigation pilot program. Norton also got funding for institutions of higher education to conduct studies on the health impacts of prolonged exposure to airplane noise and emissions and she got the District of Columbia added to a list of cities where the health studies are to be conducted. The Congresswoman is also a cosponsor of 21 amendments to address airplane and helicopter noise in the D.C. and across the nation, which will be considered by the House Rules Committee this evening, and she is pushing to have those amendments added to the bill. The bipartisan FAA bill does not include the privatization of the Air Traffic Control system, which Norton opposes. Below is the full list of noise-related amendments filed with the Rules Committee that Norton has cosponsored. Requires the FAA to review and revise helicopter flight paths for all helicopters, including military helicopters, flying in the National Capital Region – identifying and issuing new official paths if helicopters are able to fly at higher altitudes. Requires the FAA to work to mitigate helicopter noise in the National Capital Region by establishing: (1) a noise inquiry website to track and analyze complaints; and (2) a monthly helicopter noise abatement working group. Increases the Airport Improvement Program’s (AIP) set aside for noise mitigation from 35 to 40 percent. Authorizes the Secretary to waive requirements to qualify for AIP funds for soundproofing residential buildings if the Secretary determines a neighborhood has been subjected to increased noise levels as a result of NextGen. Directs Regional FAA Administrators to conduct public forums within affected local communities in their region every 90 days to address concerns regarding the logistical, environmental, and health impacts of aircraft overflight noise. Requires Regional Administrators to provide public notice of such public forums at least 30 days prior to a forum. Directs the FAA Administrator to engage and cooperate with air carriers to identify and facilitate opportunities for air carriers to retrofit aircraft with devices that mitigate noise, including vortex generators. Requires the Health and Medicine Division of the National Academies of Sciences, Engineering, and Medicine, within 30 days of enactment, to convene a committee of experts in health and environmental science to examine the various health impacts of air traffic noise and pollution and prepare and issue a corresponding Expert Consensus Report that sets forth current scientific knowledge relating to the various health impacts of air traffic noise and pollution. Establishes a Regional Aircraft Noise Ombudsman in each FAA region to enhance agency responsiveness to public concerns regarding aircraft noise. Requires the FAA to develop a 5-year aircraft noise research and mitigation strategy. Requires the FAA within 1 year of enactment of the bill to complete the ongoing evaluation of alternative metrics to the current Day Night Level (DNL) 65 standard. Permits the Secretary to carry out an aircraft noise, emission, and fuel burn reduction research and development program (CLEEN II). Requires the Administrator to also address community concerns when proposing changes to existing arrival procedures for aircraft – currently the bill only requires this to be done for changes to departure procedures. Requires the Administrator to hold a community meeting to present the reasons why alternatives proposed by local stakeholders to FAA-proposed changes to departure procedures were not adopted. Requires regional centers of air transportation excellence to conduct research on the impacts of aircraft noise on humans and effective methods for mitigating such impacts. Requires FAA to adopt and implement a system to measure the actual noise levels generated by aircraft rather than relying on computer models of likely noise levels and to make the noise measurements available to the public. Creates an FAA Community Ombudsman for each region of the FAA to serve as a liaison related to impact of aircraft noise, pollution, and safety; make recommendations based on the concerns raised by the community; and periodically report to Congress on issues raised and recommendations provided. Creates a ‘designated noise representative’ among the staff of each regional office of the Air Traffic Organization to ensure that each community with a large airport is aware of new flight paths, significant flight path changes to existing paths, and has an opportunity to discuss flight path changes with FAA. Requires FAA to review results of study required under Section 157 and mitigate noise impacts on the ground, including areas of higher elevation. Requires FAA measure noise levels after implementation of Metroplex projects and mitigate noise impacts on the ground, including areas of higher elevation. Ensures NextGen Metroplex area Noise Roundtables shall have authority to request and receive noise and pollution data from all relevant agencies.